Mar 19, 2013 - N.A. European regulators are planning to tax ordinary bank savings accounts up to 10% in Cyprus to pay for the bank bailout. The move to tax bank accounts is unprecedented in Europe making other debtor countries, like Greece and Italy, worried that the idea will spread. To save the banks in Cyprus and to pay for the latest bailout of over 13 billion dollars, European officials in Brussels agreed on March 16 that bank accounts of ordinary savers would be taxed! A one-time tax of 9.9 percent would be levied on bank deposits of more than 100,000 euros (130,000 dollars) while deposits under that amount would be taxed at 6.75 percent. Not surprisingly depositors immediately lined up at ATM’s in Cyprus to withdraw their money. To prevent on-line withdrawals government officials froze all electronic transactions from the island’s banks. Cyprus is a small country with only 800,000 people and an economy of 24 billion dollars. (In contrast, the Brookings Institute estimates the economy for San Diego County for 2012 at 188 billion dollars, nearly 8 times the economy of Cyprus!) 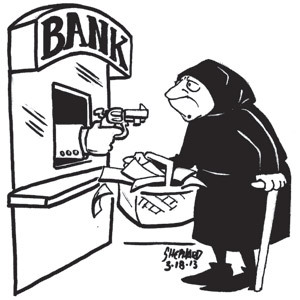 The Cypriot banking system has deposits of some 91 billion dollars many of them from wealthy Russians and other foreigners. In addition, two of the larger banks were heavily invested in Greek bonds which have endured two haircuts. The European regulators decided that all deposit holders in Cyprus should pay for the bank bailout. In fact, one plan considered, but later rejected, would have taxed accounts greater than 100,000 euros by 30 to 40 percent! By not honoring the bank deposit insurance that promises savers that their accounts under 100,000 euros are safe in the banks could have a destabilizing effect. Treating secured and unsecured depositors the same could easily undermine confidence in banks across Europe. The reaction from Cypriot workers and pensioners may prevent the Cypriot government from carrying out this tax as currently written. Depositors expect that interest on bank accounts may be subject to tax, but to tax the account directly in spite of deposit insurance is unprecedented. This proposal shows how far European regulators will go to raise taxes. All personal assets, even though purchased with after tax funds, are again subject to additional tax. Perhaps cash will have to go under the mattress again to keep the taxman away.